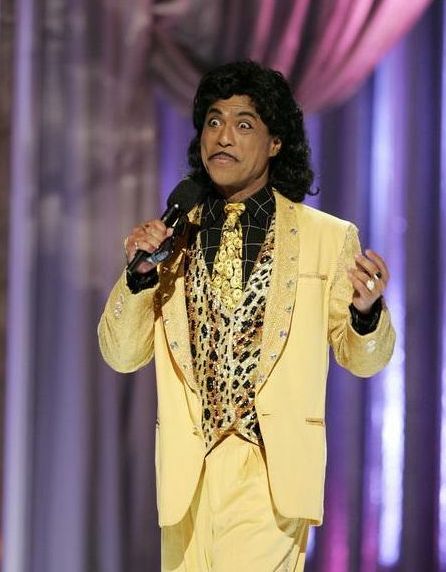 Our Little Richard Impersonator #1 started out performing as the outrageous "Architect Of Rock & Roll", Little Richard, on the Muscular Dystrophy Telethon in 1990. This was followed by performances throughtout the Hawaiian islands at various places, including dinner clubs and major conventions in Waikiki. Then major productions followed in Atlantic City at Harrahs and Ballys Casinos. In Wildwood, New Jersey. At Foxwoods Casino in Connecticut, and in Aruba, Dutch Caribbeans. In the beginning of 1993, while he was performing at Bally's Grand Hotel in Atlantic City, he was called to the Legends in Concert show in Honolulu. With all the energy that it takes to play the character of Little Richard, he has all of that and more. He has been told by people who personally know Little Richard like Herb Reed from the "Platters," and Paul Revere from "Paul Revere and the Raiders," that he is an incredible look-alike, and unbelievable sound-alike. His tribute is aimed at the younger Little Richard of the Fifties, with the big pompador and the flamboyant style that was considered "taboo" by a lot of the American people of the time. He is presently working on the 90's Little Richard Look, so don't be surprised by the change. He has lived most of his life in Hawaii, where he now resides with his wife and 4 children. He attended the University of Hawaii, where he majored in Communications (BA degree). He says that it probably contributed to his personal style with his audience. He dedicate's a lot of his free time for charitable organizations. His own experiences with life, especially after his first wife dying from cancer, have given him the desires of giving to those who are less fortunate. If you ask him about doing what he is doing, he'll tell you this. "As long as I can put a smile on the face's of the people that I perform for and feel the love from at least one individual that appreciates what I do, I feel that it's all worth it!"